After a successful pilot program two years ago, we have developed the Avi Schaefer Leadership Retreat @Hartman as an annual opportunity for a small, select, and diverse group of emerging Jewish leaders, from a wide range of identity divides, to engage with one another around some of the most important contemporary questions and challenges facing our community. The 10-day program takes place in late June — primarily based at the Shalom Hartman Institute (SHI) in Jerusalem, with excursions elsewhere in Israel and the Palestinian Territories. 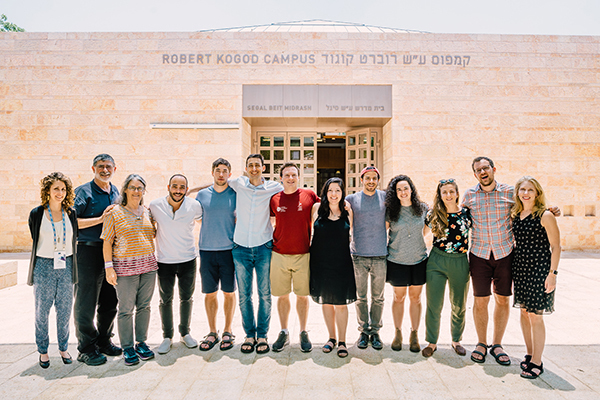 Last year, as Israel celebrated 70 years, the topic for the Hartman Community Leadership Summer Retreat was Derech Eretz: Building Character and Building Society, exploring how Jewish principles inform our conversation on the widening gap between our professed values and our lived reality. The ASF Track is part of the overall SHI Community Leadership Program (CLP) and includes additional and customized sessions and opportunities developed, designed and provided by ASF. Our hope is to provide participants with a valuable professional experience and an opportunity for meaningful personal exploration and growth. To build a cohort of Jewish leaders and professionals engaged with contemporary issues involving Israel and the Jewish world. To provide leaders with opportunities for rigorous study and facilitate high-level interactions with leading scholars and thought-leaders. To offer the opportunity to amplify their voices among key lay and professional leaders in our community, as well as foster and nurture important intergenerational understanding, connections, and relationships. To strengthen and hone effective facilitation and other leadership skills, in particular, how to have difficult to have conversations and engage in constructive disagreement. To meet with peer social activists, community leaders and influencers in Israel/Palestine to open up or deepen awareness, understanding, and relationship. Applications for Cohort III, June 24- July 3, 2019 are now open. Are you up for the challenge?